Sound (6.5/10) – Announced nearly three years ago, the SuperFi 4 was originally designed to slot in between the aging SuperFi 3 and SuperFi 5 Pro/EB models in UE’s lineup. The current SuperFi 5 (UE 600) would not yet be announced for nearly a year so the single-armature design was not yet ubiquitous to the SuperFi line and the SF4 fit in just fine. To differentiate it sonically from the SuperFi 3, the SF4 was tuned for a thicker, slightly bottom-heavy sound. The bass is not particularly powerful, rumbly, or well-extended but it is punchy, full-bodied, and very well-textured for an armature-based earphone. It is accurate but not particularly lean, lacking the control and clarity of the newer SuperFi 5 and UE 700, at times sounding a bit sluggish. Like the low end, the midrange of the SF4 sounds thick and full for an armature-based earphone despite being slightly recessed in comparison to the low end (in stark contrast to that of the SF5). At the same time, a bit of crispness and resolution is missing compared to some of the better similarly-priced dynamics and the pricier SuperFi 5. Detail is still good but due to the slightly bottom-tilted balance of the SF4, it performs better with male vocals than female ones. There is a narrow spike that can make the SuperFi 4 very sibilant with the rare poorly-mastered track but for the most part the treble is reasonably smooth. A bit of texture is missing at the high end and the very top bit of extension isn’t there but on the whole the treble of the SF4 is well-detailed and pleasant. Presentation-wise the SF4 is surprisingly spacious. Though leaning slightly towards a darker tone, the SF is a balanced earphone and carries a moderate amount of air. The soundstage is oblong in shape but at least has good width. Separation is better with the SF4 compared to the older SF3, though the positioning and imaging are less precise. An interesting characteristic of the SF4 is that it is less efficient than the rest of the UE range and can be a touch more difficult to drive. It is still more suitable for low-volume listening than the older SuperFi 5 Pro, however, which struggles to produce fine detail at lower output levels. Value (7/10) – The modestly-sized SF4 is a welcome design change from the classic UE designs, though the company has taken the ‘chrome’ theme a bit too close to heart since the release of the SF4. 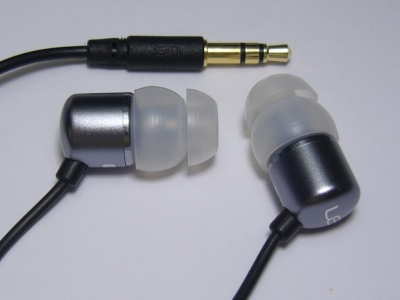 The short nozzles and tubby shells are unusual for a single-armature earphone and may lead to fitting issues with single-flange silicone tips (the fit of the SF4 reminds me of a handicapped Hippo Boom) and the build quality is typical of lower-end UE products but on the whole the SF4 is a solid consumer-oriented single-armature setup with capabilities well in line with the rapidly-dropping street price.